It’s that time of year again in Minnesota. While the hot cocoa is flowing, so is the seemingly never-ending snow and ice that piles on your roof. That’s right, ice dams could be forming on your roof right now, making you vulnerable for roof damages and even worse, a roof collapse. At Refuge Roofing & Siding, we never want our customers to experience the full devastation that an ice dam can bring upon their property. This is why we offer ice dam removal and prevention all throughout Minnesota. Before we go into our process of ice dam removal, we feel that it’s important for our customers to know what an ice dam is and when to call if they feel like they may have one. Snow can be beautiful. Honestly, there is nothing like the beauty of the first big snow. However, snow accumulation can be messy and cause lots of trouble. Snow is heavy and while it seems so soft when you pick it up, compact, weighted snow can cause lots of trouble for your roof. Lots of snow accumulation on your roof can be extremely difficult to remove and many times, people let it accumulate. As that heavy snow melts and travels to the edge of your roof, below freezing temperatures can turn that melted snow into ice on the fascia and lower parts of your roof. This process of thawing and refreezing can create a nice, large ice dam that can begin to cause many problems on your roof. At Refuge Roofing & Siding, we are experienced at ice dam removal. Our goal is to always remove the dam safely and efficiently. 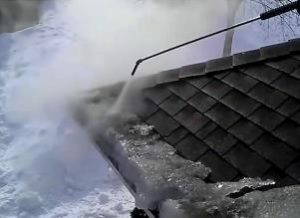 Our team of professionals use a low pressure steamer to remove all of the ice build-up, preserving your shingles and preventing further damage to your roof. We rely on those high temperatures and low pressures to safely remove it easily and effectively. Our ice dam removal specialists will then go a step further in the process by talking to our customers about potential ways to prevent ice dams from reforming. They can look at your home or business and examine potential problem areas. Suggestions like closing off all of the attic bypasses to keep the heat from traveling to the roof from the attic can help. Also, increasing the amount of attic insulation can play a major role in ice dam prevention. Our professionals are always here to answer questions and help keep your home and business safe from ice dams. For more information about our ice dam removal and prevention services, don’t wait another day. Give Refuge Roofing & Siding a call today at 651-PRO-ROOF and let us give you a free quote!